There aren’t many bands where, upon seeing them live, the adjective you’d used to describe them would be “spellbinding”. 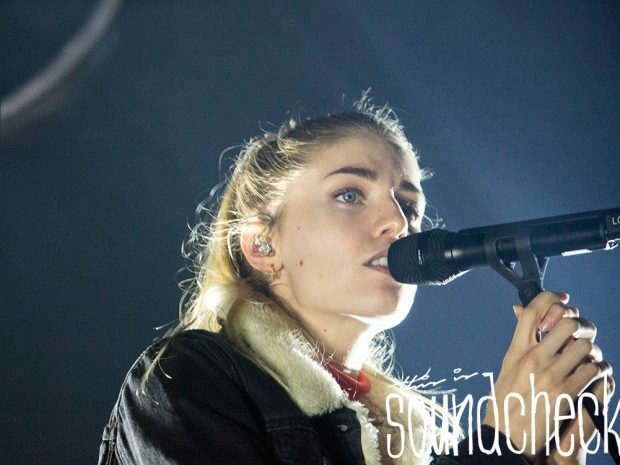 But with London Grammar, the confusion clears and makes way for awe as you hear the soaring, piercing but soft vocals of Hannah Reid. For a band whose main focus is her hauntingly angelic voice framed by the flawless production and percussion of Dot Major and skilful guitarwork of Dan Rothman, the draw for a live performance may not be immediately obvious. But take a minute to imagine THAT voice filling not only the room you stand in but seemingly your entire head, your arm hairs standing right on end and an emotional welling in your heart that you can’t quite name – and you’ll see why. Californian openers Lo Moon set the scene perfectly for what was to follow. With an Arcade Fire-meets-The Killers sort of feel, this was a fully-formed, slick band absolutely ready to make it. Quite often, support bands feel a little rough around the edges, and that’s great – but with Lo Moon, there was a real sense of watching a band with the knowledge that you’re watching the moment before something becomes A Big Thing. The musicians blended well together, and despite what felt like a slightly short set, it felt as though they’d given the audience a good range of what they could do. London Grammar’s arrival onto the stage was met with the obvious fiery shrieking and applause, but this was quickly calmed by opener Who Am I, which was a perfect example of how this minimal-sounding three-piece have been able to pack out a Glastonbury field twice. As Hannah’s pure vocal swirled over the packed audience, Dan’s occasionally U2-y guitar riffs were on hand to complement her with Dot’s production sewing everything together very neatly. Flickers followed, a favourite of fans from the debut album, If You Wait, which was cleverly and seamlessly “mashed” with Help Me Lose My Mind – a Disclosure track from their own debut, 2013’s Settle, that London Grammar featured on. One noticeable difference between this performance and what you may have seen of the group from one three or four years ago is that their stage presence has improved dramatically. With such a beautiful sound, there’s not much call for chit-chat in between songs – Hannah even touched on this herself in the middle of the performance when she said, “Well, you haven’t come to see us for a rave, have you?” With NO communication between act and audience, fans might be left feeling a little distanced and disengaged, and unfortunately for cripplingly shy Hannah, this is normally down to the lead singer – but the 27-year-old from London has come on a long way in the four years since the debut was released. Yes, in many performances, she does reveal pretty early on that she’s shy and/or very nervous, but in admitting this, it only garners sympathy and empathy from those watching her, rather than disdain. At one stage, she tells the audience that she’s actually recovering from the flu and very politely requests that an Earl Grey tea is brought out to her at the earliest convenience of a staff member. But were there any discrepancies in her performance due to the flu? No, no there were not. She was completely pitch perfect throughout the night, and was able to exert the necessary powerful but controlled force which her gift allows her to do. Knockout moments came in the form of Hell To The Liars and Rooting For You – which sees Hannah sing for about two minutes completely solo without any backing from her band members, a pretty mean feat we’re sure you’ll agree. Admittedly, the entire thing was faultless, but there’s something special about finishing track Metal And Dust – especially in the last couple of minutes when Dot gets on the drums and just hits those darn things with everything he’s got. It made an already atmospheric gig even more spine-tingling.